Made expressly for the Dirt King line of Adult and children's tricycles, the cruiser cart can hold anything from groceries, the mail, or even a small child. 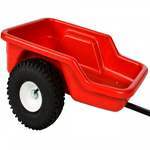 At just over two feet in length it is light enough to haul behind your cruising trike as you head down the road for the mail, pick up firewood or carry other essentials or not so essential things. 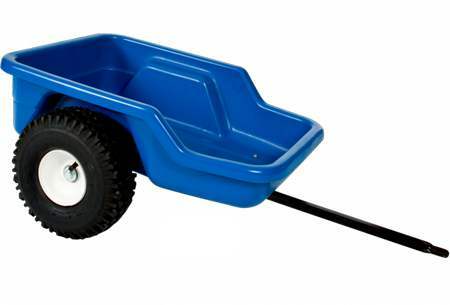 This is a sturdy cart built to go anywhere your Dirt King Tricycle will go; over rocks, snow, grass and through mud. The Cart has a vacuum formed cart basket and steel rims with steel ball bearing hubs. The tires are 10" pneumatic air-filled flotation holding 30 lbs. of pressure. Cart Width - 18.5 "
Shipping Weight - 21 lbs. Note: The Cruiser Cart is shipped unassembled. Directions for assembly are included in the shipping container. The World's Best Tricycle for children is virtually indestructible. 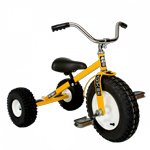 Often purchased by day care centers because the Dirt King Trike is built to last. Built strong and sturdy for rough and tough riding over rough as well as smooth terrain.